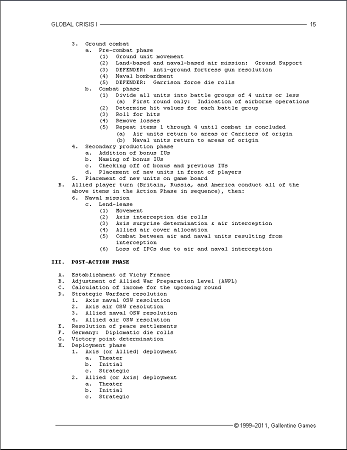 Download 4 pages from the rule booklet! 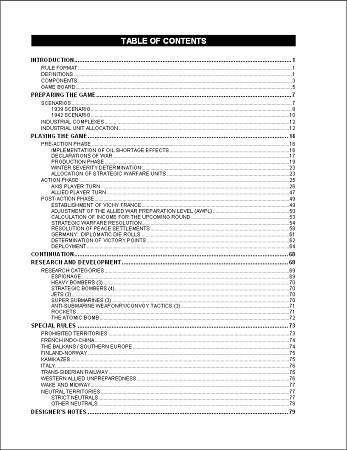 You will receive a 79-page "Read Only" *.pdf (Adobe Acrobat®) file that you will download after purchase. 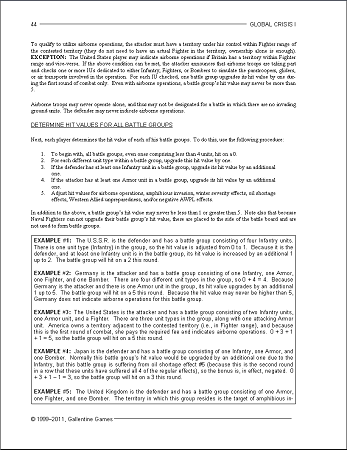 This is a very extensive replacement rule book for the "Classic" version of Axis & Allies® first published in 1984. As such, buyers must own, or have access to, Adobe Acrobat® or another *.pdf file viewer in order to view and/or print this document. When printing, print off all odd pages, then reload them into their printer and print the even pages. This is because the margins are off-centered to provide for 3-hole punching. A copy of the original, 1984 version of Axis & Allies is needed to play the game. 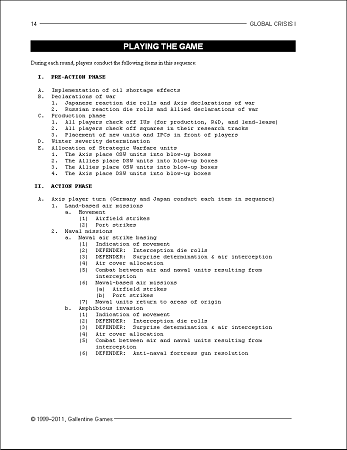 In addition, players will need five photocopies of the Production Graph on page 13, some pencils, and possibly some extra sheets of graph paper. No additional components are necessary, nor is any coloring or alteration of the original game pieces or board required. Although Global Crisis I uses Axis & Allies® components, it completely replaces the Axis & Allies® rules. 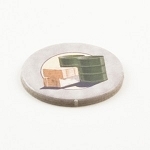 Familiarity with Axis & Allies® is helpful but is not required to learn and play Global Crisis I. 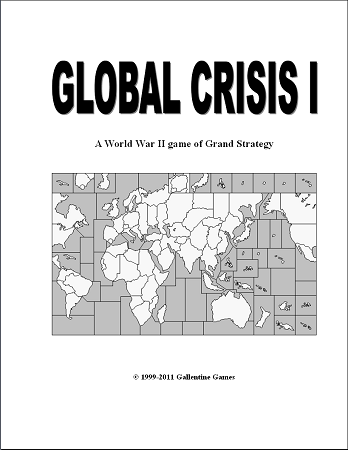 Global Crisis I is a game of grand strategy that incorporates many aspects of World War II. 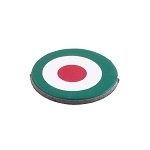 As such, it is a simulation of the strategic, economic, operational, and sometimes diplomatic elements of war that faced the leaders of the major belligerents of that conflict, thus introducing more realism and historical flavor into Axis & Allies® Classic. It is not simply a game of conquest; it is a game of offense and defense for both the Axis and Allied powers. 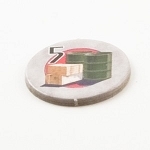 The object of the game is to win by conquering enemies faster or by surviving longer than the playersâ€™ historical counterparts. In this way, the Axis powers may both be defeated yet still win the game. "Although Axis & Allies® is an enjoyable game, as a simulation of the Second World War many of its elements are entirely inaccurate. In addition, many issues that the leaders of the major belligerent nations were forced to deal with that completely altered strategy are entirely lacking. 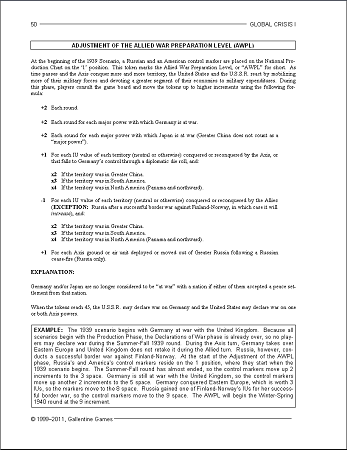 The purpose behind the creation of Global Crisis I was to address this situation by providing a rule book whereby Axis & Allies®, in effect, becomes an accurate simulation of World War II, integrating as many historical realities of the war as possible." Buyers must own, or have access to, Microsoft Word in order to view and/or print the document. A copy of the original, 1984 version of Axis & Allies is needed to play the game. When printing, print off all odd pages, then reload them into their printer and print the even pages. This is because the margins are off-centered to provide for 3-hole punching. This document is edit-protected, choose "Read only" when you open document..
Q: I ordered and paid for the rules now how do I download them?